We received a nice account from Fred Miller of Portland, TX, relating his experience at this year’s Texas Star Party with a Tactical Night Vision Company (TNVC) night-vision monocular outfitted with our astronomy adapters. We called him on the phone to discuss putting his report on our blog . He agreed and added that the feel of sweeping the sky with night-vision setup was that of the proverbial “kid in a candy store”. *The black barrel is the EBX-2120 extender. The O-ring is to position the eyepiece so the chrome barrel doesn’t slide down past the top of the Paracorr, see link in More Info section below. What I think it can do best is to serve as tool for public star parties. The views are more like those of astro-photos the public sees in current media. This was especially true of the wide field views at 32x with a Tele Vue 55mm Plössl. 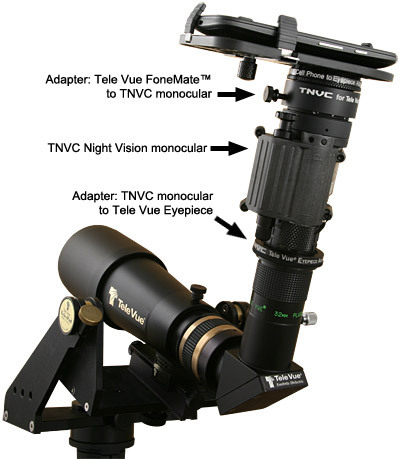 To accomplish this in my Dob, an eyepiece barrel extender (Tele Vue model EBX-2120), with a 2-inch rubber O-ring slid over the threads*, was screwed into the base of the eyepiece and placed into a Tele Vue Paracorr Type-2 (coma corrector for Dobs/Newtonians) set at the “A” setting. This low-power 55mm eyepiece works better with the intensifier than without because the large central obstruction of my fast Dob is not visible in the intensifier. The results were best for open and globular clusters. Finding tiny globs is a snap in the Ophiuchus-Scorpius region. But the dynamic range from the brightest to dimmest stars is decreased. This was demonstrated with Omega Centauri and you could clearly see the “foot print”** on its face. This view got many, many wows! On galaxies it brightened the cores, but the range from dimmest detail to the bright core was decreased. It might be useful to confirm the presence of dim galaxies under a dark sky. But it intensifies everything including reflected light pollution. Adding a 6-nm hydrogen-alpha filter to the end of the Paracorr Type-2 gave amazing views of M8, M16, and M17 (all emission nebulae with clusters). The very best view was the Lagoon Nebula (M8) with the 55-mm Plössl. Others said it was a view like nothing they had ever seen, and I agree. You could see stars embedded in the hot gas clouds: a Hubble-like view with a very slight green color. Also one could see the entire Veil Nebula with this setup. 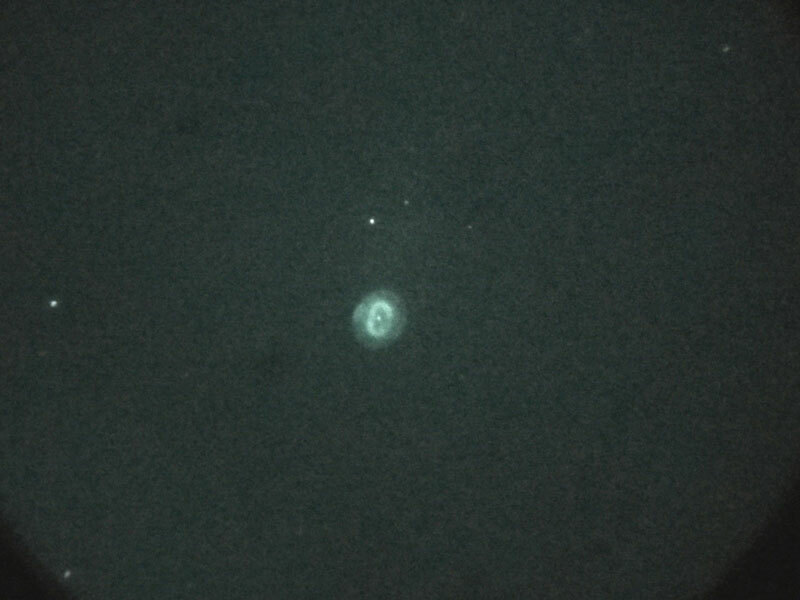 An image of the planetary nebula NGC 7662 taken with an iPhone through an 18″ f/4Dobsonian reflector, a 7mm DeLite eyepiece, Tele Vue FoneMate™ adapter, and the PVS-14 night vision device. This is an average of a 20-image burst through the iPhone. Credit: Dennis diCicco. By setting the intensifier objective at infinity and covering it with a hydrogen alpha filter you could hand-hold while scanning the Milky Way at 1x. You could see the North American and Pelican Nebulae plus M8 Lagoon, M16, and M17. At the southern end of the Milky Way I could see small spots of bright nebulae which turned out to be IC-4628 (“The Prawn Nebula”) with nearby NGC 6231 forming the “False Comet” collection of objects. I observed this at 138x with the 13mm Ethos and the intensifier. In the future I want to try viewing the Markarian galaxies which have hydrogen alpha regions. I will keep you posted of future results. M42 with John Pratte’s 32-inch, f/3.6 Dobsonian with 17.3mm Delos on night vision monocular. Video by Darren Drake using Tele Vue FoneMate™ on Samsung Galaxy Note 4 smartphone at Winter Star Party 2017. 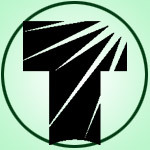 Tele Vue’s Night Vision page on website (mobile site). Using 55-mm Plössl with Paracorr on Night Vision monocular (Getting the Most Night Vision Field with Your Telescope) also on mobile site. **”Footprint” commonly used by Australian amateurs, “keyhole” is another term for this dark area. Next Next post: Return to Stellafane!